Cleanfield made a big media splash in Ontario, Canada during the mid-2000s with its claim of producing a new wind turbine suited for mounting on buildings. 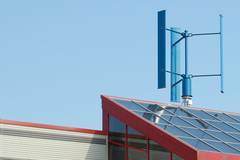 At the time, the Toronto Renewable Energy Cooperative was installing a conventional wind turbine, a 600-kW Lagerwey, at Toronto’s Exhibition Place (Ex-Place) and the province was weighing an aggressive renewable energy policy. Note: This article is an excerpt from Wind Energy for the Rest of Us: A Comprehensive Guide to Wind Power and How to Use It. The 576-page book is distributed by Chelsea Green Publishing and will be available in late 2016. Opponents of wind energy were quick to seize on the fact that Cleanfield claimed their turbine could be installed on buildings. Thus, there was no need to install the commercial-scale turbine at Ex-Place in downtown Toronto, or any commercial-scale turbines anywhere in Ontario for that matter. If the province wanted wind energy, they could simply just put wind turbines, like solar panels, on rooftops. If Toronto wanted wind energy, they could just put the wind turbines on Toronto’s skyscrapers. The media, politicians, and over-enthusiastic renewable energy advocates never bothered to verify the claims of Cleanfield. This was easy enough to do. The design was not new. The design had never been tested, so there was no way that Cleanfield could honestly make pronouncements on its presumed advantages over conventional wind turbines. In 2007, Cleanfield told the Region of Peel, Ontario that they hadn’t completed testing. By 2013 when their web site went dark, Cleanfield had still “not completed testing” even though they had installed a unit at the Atlantic Wind Test Site on Prince Edward Island (now known as the Wind Energy Institute Canada). After more than a decade of “development,” and after receiving funds from the province of Ontario for its “innovative” technology, Cleanfield never produced any performance data. Some of the “testing” Cleanfield often pointed to were aerodynamic measurements made in 2007 by McMaster University in NRC’s wind tunnel outside Ottawa. Cleanfield crowed about the test results, implying that there was academic endorsement of their product. (This sounds strangely similar to McDonnell Aircraft’s wind tunnel tests from an earlier era.) What Cleanfield’s promoters wouldn’t say is that wind tunnels are useful for testing airfoils, but not much else. They are not a substitute for measuring how much electricity a wind turbine will actually produce in the field under real-world conditions. Worse, in an embarrassing attempt to appease a critic of their design, Cleanfield sent “test results” as proof of their claims. The “test results” were merely a chart of the generator’s voltage output relative to wind speed. Whether Cleanfield knew—or cared—that this was meaningless information is unknown. It’s simple enough to measure electrical energy; every home in North America has a kWh meter that does just that. When a promoter of a wind turbine presumably designed to produce electricity doesn’t know this, and can’t provide this kind of information, it calls into question their competency in every other aspect of the wind turbine and its intended use—rooftops in this case. There also was the odd case of their product literature. Product literature for many newly introduced small VAWTs is often long on hype and short on reliable data. One Cleanfield brochure listed the rotor’s diameter, the length of the blades, and the swept area. What was odd was the swept area, 13 m2, didn’t match the other parameters. Because Cleanfield’s turbine used an H-rotor, the swept area is simply the length of the blades times the rotor’s diameter. The rotor was 2.5 to 2.75 meters in diameter, depending upon the source, and the blades were 3.1 meters tall. The area swept by the rotor was—at most--9 m2. It’s hard to imagine how this got by. This measurement is something so fundamental and easy to check with an H-configuration VAWT that not getting it right is inexcusable. The implication in these three examples is that either Cleanfield didn’t understand wind energy, or worse, they were being intentionally misleading. Everyone makes mistakes. It’s conceivable that they might get something wrong. But in the case of Cleanfield, there was a pattern of mistakes, blunders, and promises that were never fulfilled. In the spring of 2013, the company defaulted on its debt according to news reports and by the fall their web site was dark, nearly a decade after the product was launched in Ontario. Cleanfield lasted longer than most other small VAWT products and their example is far from the worst case. Fortunately, the commercial-scale turbine at Ex-Place went ahead and it has been generating nearly one million kWh per year for the past decade. This turbine has since been enormously successful at demonstrating the use of wind energy in an urban setting—and it’s not on a building.